Green engineering represents a paradigm shift in waste management from end-of-pipe treatment to source reduction. 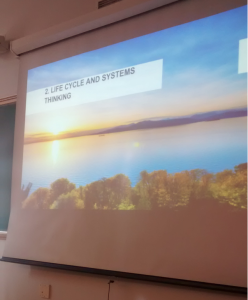 One of the key principles in green engineering is life cycle thinking, which is applied to identify the “hot-spots” of a product or process over the whole life cycle so that changes can be made to improve the greenness and cleanness of the product and process. 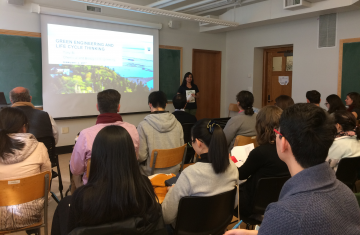 This talk will discuss the relationship between green engineering and sustainable development, and examine several chemical and energy systems using life cycle analysis to identify major issues for future improvements. 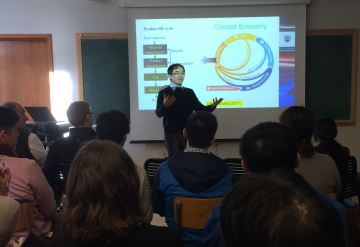 Professor Bi telling the audience about the advantages of a circular economy.